Doc is one of those fictional characters that never leaves a reader’s memory. This book is dedicated to a man by the name of Ed Ricketts who was a marine biologist with a lab, like Doc, on Cannery Row in Monterey, California. Whenever I discover that a fictional character is based on a real person, it seems to lend extra life to that fictional person. It puts bones under the skin and blood in the veins. It becomes evident, very quickly, how much John Steinbeck admired Ricketts. The biologist has a profound impact on his writing and also on the writing of Joseph Campbell, who, like Steinbeck, lived in Monterey and spent as much time in Ricketts’s lab as possible. The influence of Ricketts on Steinbeck is palpable in The Pearl, Cannery Row, Sweet Thursday, The Log of the Sea of Cortez, The Moon is Down, and The Grapes of Wrath. Ricketts’ death, killed tragically young when his car is hit by a Del Monte Express Train just up the hill from Cannery Row, has a profound impact on many people. Steinbeck’s writing suffers after the death of his friend, and in the opinion of many critics, his writing after 1948 is diminished, except for his final epic East of Eden. 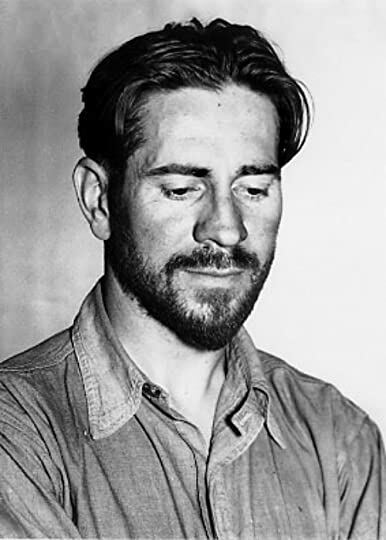 It makes me wonder, would we know John Steinbeck’s name if he’d never met Ed Ricketts? 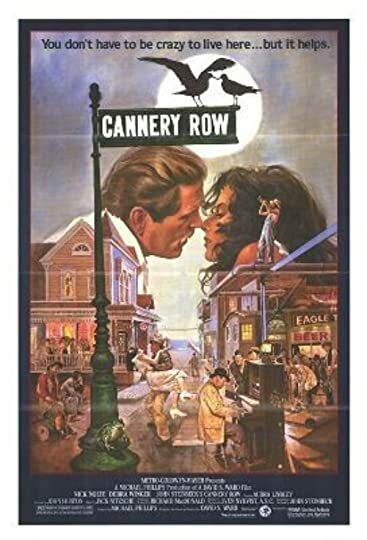 Or what if he had never been influenced by what he experienced while living in Cannery Row? It is a place at the right time tailor made to inspire a writer. Lee Chong runs the grocery store which is really a general store because you can find just about anything that you need and most things you never knew you wanted. Lee never discounts. Everything is the price it was when it was first carried in the door. He “rents out” a building he acquired as trade for an overdue grocery bill to a group of layabout guys who work when they have to, but choose not to work when they absolutely don’t need any money. It was interesting to see a bit into the mind of Lee as he ponders the universe and weighs the benefits and risks of any investment. He has an ongoing financial battles with the boys from The Palace Flophouse and Grill, which is the rather creative name the guys decided to use to refer to the Lee Chong storage shed, as they try to tempt him into their many doomed enterprises. There is also Dora Flood who manages the Bear Flag Restaurant, but she is more accurately described as Madam Flood as the Bear Flag Restaurant isn’t a restaurant, but a whorehouse. She gives twice as much to charitable organizations as anyone else. She bends over backwards (Not so much over a bed anymore) to help people in need. She never turns a whore out when they get too old to be productive. "Some of them don't turn three tricks a month, but they go right on eating three meals a day." She is a whore with the heart of gold, but with an astute head for trying to not agitate the more conservative wives of the community. 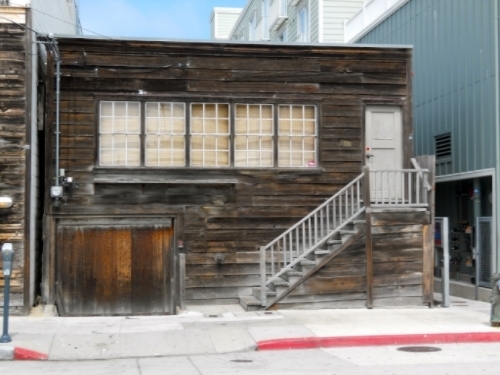 Ed Ricketts’s lab on Cannery Row. Doc is lonely, but he isn’t alone. He doesn’t have a John Steinbeck living next door or a Joseph Campbell living down the street, but he never seems to lack for female companionship. Whenever the Sistine Choir or Gregorian Chants can be heard coming from Doc’s laboratory everyone knows he is in the midst of wooing well on his way to fornicating. Doc takes a road trip down the coast of California to collect some specimens for his laboratory. We travel along with him and as the towns are listed off...Salinas, Gonzales, King City, Paso Robles, Santa Maria, and Santa Barbara I had a distinct heart pain of longing for the Golden State. He stops off frequently to sample the local cuisine and also manages to cross a very unusual concoction off his bucket list. “If a man ordered a beer milkshake he'd better do it in a town where he wasn't known.” He orders more than once while on this trip a healthy slice of pineapple and blue cheese pie. It sounds so weird that I have to try it. Steinbeck sprinkles in some poetry from Black Marigolds by E. Powys Mathers. It is sensual and evocative poetry. Steinbeck includes several stanzas and with each one I read my appreciation for Mathers continued to grow. This book is an ode to a friend, an ode to a period of time when I can tell Steinbeck may have felt most alive, and it is an ode to Cannery Row. A perfect storm of diverse elements that contributed to making Steinbeck one of the Great American Writers. There is a film version of the book starring Nick Nolte and Debra Winger which I have queued up to watch sometime this week. It looks like they muck up the film version with a love story, but I will reserve judgment until I’ve actually watched it.